Like Merchant Ships: Thank You Notes As Entertainment? Thank You Notes As Entertainment? Andrew and I were fighting over our pretty new notecards from Jordana. Before he got his grubby little hands on the second one, I unearthed a box of Ogden Nash poem cards just for him (50 cents). He drew stories, transcribed by me, and wobbly "THANK YOU ANDREWs" for over two hours straight. I only hope I can keep telling him that writing thank-you notes is good entertainment! And to think I almost didn't buy those garish cards! This spring, I'll be scooping up all the kid-friendly cards I can find. At yard sale prices, they're cheaper than using our own envelopes and paper. PS--How fun are these new 39 cent stamps with images from classic picture books? I make all my notecards and have figured out that they cost .02 cents each to make. Using old magazines cut up for the card picture and the envelope and getting the paper on sale - plus I get the fun of doing it! :) I hope my children will believe writing thank-you's is good entertainment as well! Good job training him early! 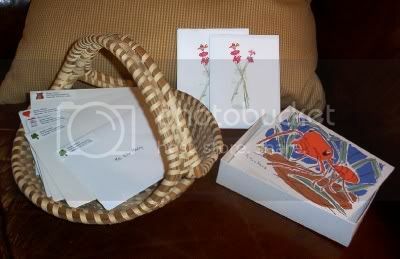 This box of cards broke down to .04 cents apiece, so not *too* much more than your beautiful handmade cards. You know, I think one of the things that excited him so much about writing the notes was the fact that they were REAL notecards, like the kind that he sees Mommy write in all the time. For that added enthusiasm, I'll gladly pay a few pennies extra. Besides, I have to make the most of this new developmental stage while it lasts! Yes, you make a good point about the special-ness of the cards he was allowed to use. And really, who can put a price on the benefit of your son learning at a young age the joys of writing a note - much more, a thank-you note!